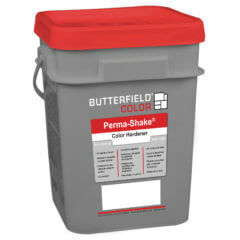 Packaged in durable, easily manageable 50 pound square pails. Allows for approximately 100 sq. ft. of coverage for dark colors and 80 sq. ft. for light colors. Contains water-reducing, dispersing agents to ease finishing by reducing surface tearing which reduces the required manpower and amount of finishing time. Standard colors include wider variety of bright vibrant colors achieved with standard gray concrete. Creates an extremely dense surface that is resistant to foot and vehicular traffic, and extreme weather.